With global production having passed five million cars at the end of April 2016, the highly acclaimed Mazda3 is updated with the launch of the 2017 Mazda3. The new range will start at €23,295. Highlights across the full hatchback and saloon range include subtle exterior changes and an updated cabin. In addition, we see the introduction of G-Vectoring Control (GVC ), the debut of Mazda’s SkyActiv-Vehicle Dynamics technology in the Mazda3 range. Like with all new-generation Mazdas, the carmaker tells us it developed the latest version of the 2017 Mazda3 based on a human-centred development philosophy, paying close attention to human traits and perceptions to deliver a satisfying sensation to drivers and passengers. The sporty compact also received an extra portion of Jinba Ittai, Mazda’s rider-and-horse-as-one approach that originated as the guiding principle behind the iconic Mazda MX-5 roadster. GVC varies engine torque to optimise the load on each wheel, providing more precise handling as well as a smoother ride under virtually any driving conditions. Diesel-powered versions of Mazda’s newest compact get high-precision boost control, which enhances accelerator responsiveness. It also comes with one new diesel knock reduction innovation (natural sound rrequency control ) to dampen the vibrations that cause knocking in three critical frequency ranges, while extending another related technology (natural sound smoother ) to all diesel models. Inside, the 2017 Mazda3 has usability and practicality added, with for example, an enhanced ‘Active Driving Display’ featuring a high quality full-colour display. Mazda says that it eases communicating information to drivers without any need for them to take their eyes off the road. Among other things that Mazda says that it has also improved steering wheel ergonomics. Outside, the award-winning hatchback and saloon received a redesign featuring a revised grille adding to a solid, low stance with a strong, composed physique. Advanced active and pre-crash safety equipment includes advanced smart city brake support. Its forward-sensing camera replaces the current system’s laser, expanding the speed range for detecting other vehicles while adding pedestrian detection capabilities. The 2017 Mazda3 will also be offered with LED headlights and an adaptive front lighting system that adjusts the angle of the headlights when cornering. The 2017 Mazda3 range will start at €23,295 (RRP ) and the powertrain line-up will continue to feature two clean diesels, the SkyActiv-D 1.5 (105 PS ) and SkyActiv-D 2.2 (150 PS ). There are now two naturally aspirated SkyActiv-G petrol engines – the SkyActiv--G 1.5 (100 PS ) and the new efficient SkyActiv-G 2.0 (120 PS ) completing the Mazda3 powertrain choice. 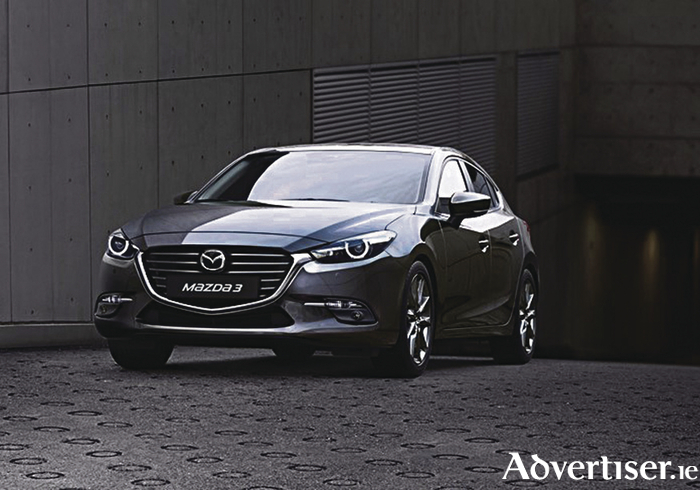 They are mated to a crisp shifting six-speed SkyActiv-MT manual or SkyActiv-Drive automatic transmission.